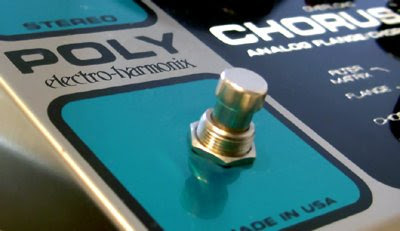 Here's a demo of the Electro Harmonix Stereo Poly Chorus processing various analogue sources (Jomox SunSyn, Cwejman, Livewire and Plan B mods). See the inline comments for details on what you're hearing. I've been looking for an analogue and more hands-on counterpart to Logic's Modulation Delay for some time. Having tried various Doepfer BBDs and the Analogue Systems Chorus/ Reverb and found them either too dirty, uninspiring or mono, I have to say I'm over the moon with this stomp box. The chorus sound is warm and wobbly, the flanger, while not as extreme as some I've used, is nicely resonant and the echo is an added bonus. It might be completely devoid of CV inputs but that's nothing that a twist of those big knobs can't make up for.